Senior US administration officials give a briefing to reporters on American President Barack Obama’s announcement on Friday in Bali that he will send Secretary of State Hillary Clinton to Burma on Dec.1 for a two-day visit. Hillary Clinton is scheduled to hold talks with Burmese President Thein Sein and opposition leader Aung San Suu Kyi in this first visit to the country by a US secretary of state since military rule was first imposed nearly 50 years ago. Released by the White House on Friday, the full text of the briefing on Burma by senior US Administration officials appears below. Senior US administration official: Just to give you a bit of background -- this comes after many months of engagement between the United States and Burma, which we can speak to. The President, of course, had a policy of maintaining the very strong pressure that we apply on the Burmese government while also testing engagement. And we felt that this was an appropriate step given the movement by the Burmese government in a range of areas that we can discuss. The only piece I'll just start with as relates to the President, he's been regularly briefed on this for some time now; he's discussed this with Secretary Clinton for some weeks now. The final piece as far as we were concerned that was very important to take place was for him to be able to call Aung San Suu Kyi last night to confirm that she was supportive of this engagement. He called her from Air Force one. He had a very substantive discussion with her where she was able to update him on her view of the political situation within Burma. And again, my colleagues can speak to that as well. The President, I have to say, was very -- this was his first conversation with Aung San Suu Kyi. He was very struck by both her substantive observations and her warmth. As he said to us, he has great -- and as he said to her, he's long been a great admirer of hers for her struggle for democracy and human rights, and so it was a particularly meaningful conversation for the President -- but also a friendly one. She even asked the President how Bo, the dog, was doing. (Laughter.) So they were able to have a light series of moments as well. Q: How long was the call? Senior US administration official: I think it was about 20 minutes -- 20 minutes or so. The President began, as you just heard, by expressing his great personal admiration for her for her commitment to democracy, to political freedom and to human rights, and indicated that he wanted to consult with her on the significance of the developments over the past few months in Burma and solicit her ideas and thoughts about the best approach. He made very clear that our goal is to see a Burma that's responsive to the will of the people and needs of the people of Burma, and one that promotes the well-being of all of the diverse peoples in that country. She talked with the President about the developments and emphasized the importance of a reconciliation process in Burma that is fully inclusive. She encouraged the President to make clear to Burma's leaders that the U.S. will be willing to work with them if they are, in fact, demonstrating that they are willing to work with the world and with her. She advised the President that it is valuable and important for there to be direct lines of clear communication between the U.S. and the leadership in Burma. She strongly welcomed the prospect of a visit by Secretary Clinton for the purpose of increased dialogue and engagement both with her and her associates and with the government there. We have all the resources, you name it then we have it. All the Burmese talented people are waiting for this opportunity to go back and build our Home. Currently I am studying at MIT and thought of going back and make development at Burma after my graduation. To be honest,I know that burma will alliance with US when they started to delay the DAM project. Otherwise, they cannot deal with the China who is the main supporter of burmese general over decades.On the other hand, it is the good time for US to go inside it. The world economy goes down and asia pacific is the good market to make new businees.Again, a country like burma is the good place for them to restart again. All in all, there are so many benefict from both side. Country will develop more, there will be more jobs rather than girls are working at karaoke and massage. If the Generals are really looking forward to the changes, this is really good sign. Currenly thailand is flooding and it is the good time to start. We strongly welcome it . Come on Myanmar! A lot of Burmese around the world are looking forward and are glad of the changes taking place in the state. i think that if they can build the real foundation, Myanmar can be on top in South East Asia by 30-40years from now.It will also depend on the next generation of Burmese citizens too so it all starts from the classroom..
Where can I find the best roast duck in Yangon? Than Shwe was like a naughty boy who jumped over the fence and faced with a large mean dog. After voluntarily giving in to the Chinese who throughout the history of the world has not shown an ounce of conscience or qualm but sheer ruthlessness and cruelty dealing with their own or the others, with concessions after concessions ( where his various lieutenants went to China and signed MOU’s) he finds he can't undo it now. Chinese now acts like they own HIM. The distress signal (stopping the dam) was picked up by the ASEAN and the “developed countries” readily waiting in the wing. They also have similar interest as well now. To build rails, roads and ports for faster and more profitable access across Burma for the benefit of multinationals companies with ready consumer market of the insatiable Chinese. All of these plans will benefit enormously to the companies concerned as well as the Chinese and the ASEAN and “western” governments. All except the Burmese public who will be left with irreversibly damaged environment, loss of traditional farm land, loss of income and livelihood, fractured families and social structure and advent of consumer culture, and erosion of morality, traditional culture and social fabric. The reaped benefit would still go to a few connected Burmese regardless of who joins the government now. This will also entails “annihilation” of anybody in the way, now with the added support and at least tacit approval of the “democratic” countries and NLD. Even though the Americans would want the Chinese not to be sole handlers of the military (in whatever form they want to present themselves with eg. Fake parliament) they would be in thorough agreement in the matter of the loot of the country along with ASEAN and other Asian powers. It is like the Burmese hare is chased by the Chinese hounds into the path of the gun men the Americans and the ASEAN. The result for majority Burmese will be the same. For the majority Burmese the result would simply be loss of any ownership – of traditionally own land and natural reserves of the country - and their livelihood with benefit going to small clique of people who will be the vocal crowd drowning out the feeble voice the people have. And imagine these poor things singing the praise of the arrival of the saviour Americans. It is very enlightening for the fact that concern about political prisoners is mentioned in this interview. Although they are still behind the bar, their contribution towards Burmese democratic process should not be forgotten. Alexander Graham Bell invented telephone and Wrights brothers’ pioneered aeroplane. But the real beneficiaries are the Telco giants and Boeing, Airbus etc. Dear respected political prisoners, you may not enjoy any luxury. But if Burmese people, including ethnic nationalities, enjoy peaceful and developed nation, your sacrifice will be worthy. "The deals are made, the proposals are exchanged, and the promises are rendered, signifying progress in the Burmese political scene. The ethnic minorities are, however, once again remain marginalized and neglected at the crossroad of political progress. The ethnic issue is at the bottom of their to-do list for any interest party involved. The suffering, displacement, and lives of the civilian Kachins are seen merely as a collateral damage on the road to progress. Therefore, the so-called “constructive engagement” with the Burmese government so far transpires as a double-disappointment for the ethnic minorities. It is evident that the more the Burmese government is successful in its international diplomacy, the more violent and atrocious they become in dealing with the ethnic minorities." I support the constructive engagement approach and the reforms made, but I am so worried to see that again no one brought up and discussed the situation of non-Bamar peoples in Burma. The wars, the tens of thousands of people who have had to flee their homes, the women raped, people killed, tortured, and living in constant fear for their children, friends, families. Are the Burmese Army's activities in the lands of Shans, Kachins, Karens, Chins, and many others, as well as the situation of Rohingyas too complicated to discuss? Do the ethnic Bamar democratic leaders of Burma feel so much less responsible in front of the non-Bama peoples? What will be the price of our silence? While the voice of other ethnic peoples is less loud, they are noticing what is going on, and see it from their unfortunate perspectives. 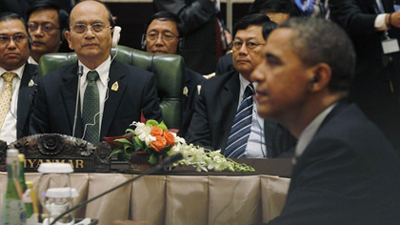 In the photograph Maung Thein Sein and his cronies seemed to be listening eagerly to what Obama had to say. Where is Than Shwe and Maung Aye in this equation? looks like ethnic issue has to come second after they fill their stomach. Fresh winds are blowing inside Burma. Every things depend on both side. The Burmese mass is waiting for the good atmosphere to create inside Burma. No more fighting with ethnic and government soldiers. After all the end justify the means. Let us wait and see.